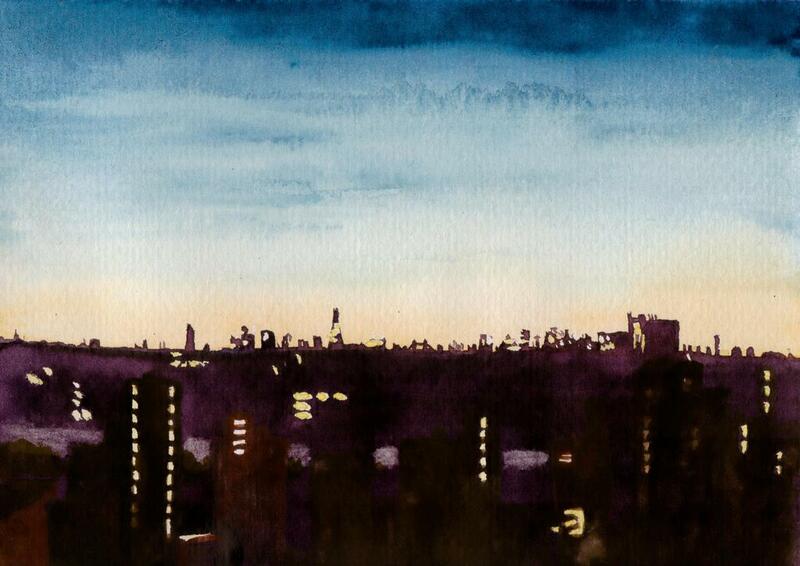 This is an early attempt at a watercolour skyline. Well, an early attempt at a watercolour anything actually – I’m guessing that it was my 2nd or 3rd time I’d tried painting anything at all. 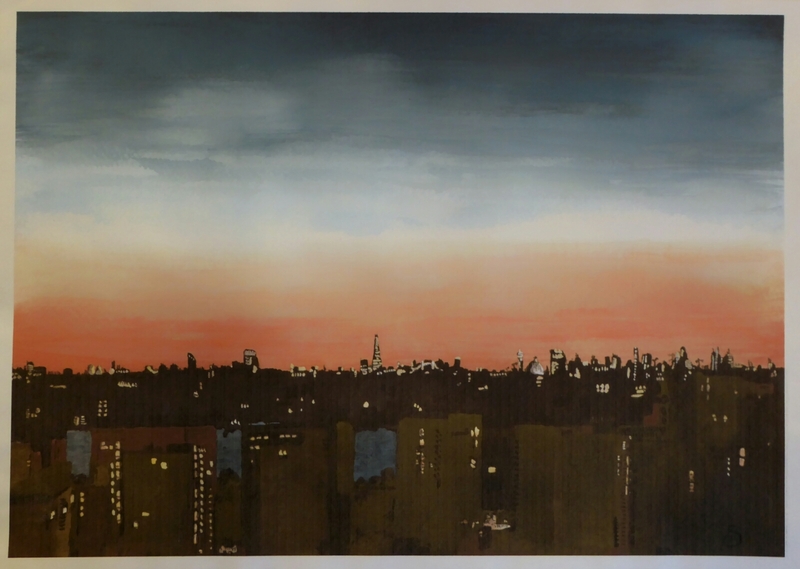 Starting off with a small rough concept, I drew out rough outlines of the buildings, the horizon and then painted the foreground windows with masking fluid before throwing any paint around to ensure the white of the paper came through. I’d never done any graduating shades before so this in itself served as a learning experience before moving onto the bigger version. The skyline was then painted in after over the top, the light patches in between the foreground buildings is the river Thames which was lit by either the moon and/or the general ambient light you have polluting the skies around any large city. To give some idea of the viewpoint, the direction and the location of the buildings here is a map, you can see the river in front and the wide viewable expanse – click to compare. It surprises me when you have City such as London, or anywhere really where there’s a winding river. The buildings on the skyline never tally up with where you have a mental map of them being if you’re familiar with the walking routes. Direct observation is essential for something like this picture I’d imagine. In person the actual sunset is so vibrant in the red spectrum that any representation of the colour could probably look oversaturated whatever you do. As indeed this one is. To capture the full deep black of the night sky as moves through dark blue into a rich red-orange far exceeded the beginner skill level and maybe the capacity of the paints – but it was worth a try. It may have been the first attempt but it certainly won’t be the last. Size: A4. Watercolour sketchpad. Cheapo beginner’s watercolour set.